See life through MJ's optimistic eyes. The Book Latte is a new coffee shop that is creating quite a buzz here in Iloilo. It’s not the usual coffee shop – they would like to be known as a “revolutionary coffee shop” because it is the first of its kind in the nation to be perfectly complemented by a library! 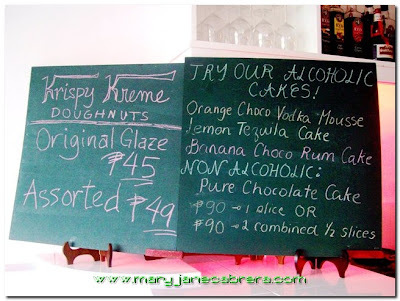 Not only that, they are also the first ones to serve the Ilonggos Krispy Kreme donuts (original glaze or assorted). The Book Latte has an impressive collection of books. Some coffee shops have books but they don’t allow their customers to take them home. But in Book Latte, simply become a member and borrow a book to take home or curl up with your book of choice on one of their comfortable lounges while enjoying coffee made from the richest, organic beans. They have over 1,000 books, magazines, learning materials and periodicals to choose from in a wide range of categories like classics, popular fiction, motivational, romance, business, reference, young adult books and more. 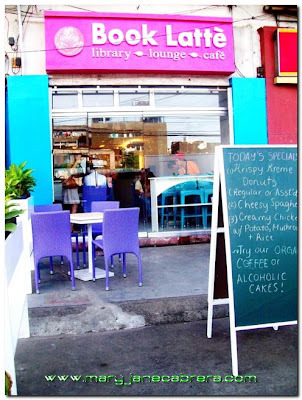 The Library (photo from Book Latte's Facebook account). Now let’s talk about their coffee. Book Latte provides premium coffee and drinks with more than 30 flavors to choose from. And they say that all their beans are ‘organic which means that they have no flavor enhancers or fertilizers.’ They like to think of themselves as an “eco-café” because they do not use plastic utensils or cutlery and they don’t like Styrofoam products; all of their appliances are energy savers and their taps are equipped with low flow water heads. 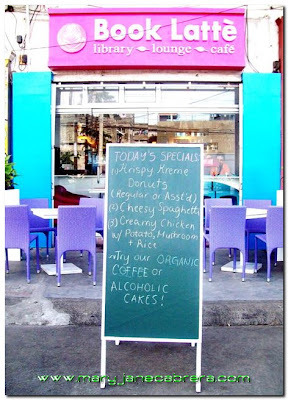 Aside from the organic coffee they also offer healthy juices and shakes, coffee laced with liquor and alcoholic cakes! They also serve affordable daily breakfasts. And another great thing about this café is that everything on their menu is less than Php100! So here’s how to become a member at Book Latte. You need to fill out a membership form and show a valid student ID (if you’re a student) or employee’s ID (if you’re employed) or a passport/driver’s license for those who are not employed. If you’re less than 12 years old then your parent’s signature is needed to become a member. Only residents of Iloilo and Filipino citizens are allowed to become members. Annual membership rates for students is Php180 per annum while for non-students is Php220 per annum. Membership entitles you to a lot of perks! A 10% discount on everything on the menu (you must be over 18 to order cocktails or alcoholic cakes). The chance to borrow books and magazines at the library. Access to diverse range of learning materials perfect for research and school work. Access to the lounge and study area. Plus other exciting perks offered exclusively to members! Free WIFI for 2 hours. 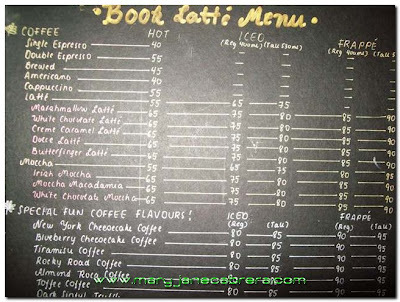 Book Latte's menu - well half of it actually. LOL! Book Latte opens at 8am to 8pm on Monday to Saturday and 8am to 5pm on Sundays. You can contact them for inquiries – 333-2574. Located at Quezon Street, (from Robinsons Place Iloilo National Bookstore Exit, turn right and walk roughly 2 minutes until you see Condura Golden Appliance). So apply for membership at Book Latte now and I assure you that you will not regret it because I applied for membership myself the first time I went there! This is the place for us coffee lovers and bookworms! 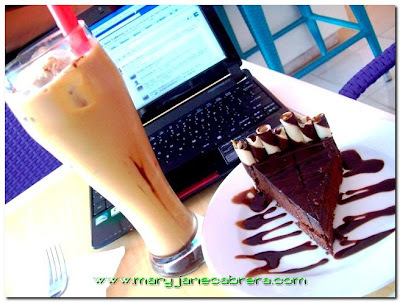 Mary Jane’s Niche started as Mary Jane Cabrera’s personal blog. When she’s not raving about random stuffs, she's writing about the things that interest her like traveling, music, photography, events, food, her adventures, her hometown, her online business, etc. MJ is a very optimistic person and this blog reflects that. This blog will also update you on MJ’s journey of personal growth and she hopes that you will learn lessons from her posts and be enlightened as well. She hopes that through her blog posts she can encourage you to get started on your own growth journey and find balance in your life. Manifest what you want, take control of your life and see your awesome life through MJ’s optimistic eyes! 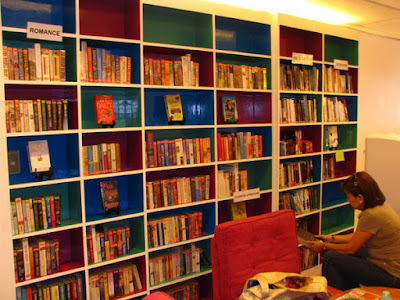 16 Responses to "Book Latte – The First Library, Lounge, Café in Iloilo"
hi! where is book latte located? Book Latte is located at Quezon Street, (from Robinsons Place Iloilo National Bookstore Exit, turn right and walk roughly 2 minutes until you see Condura Golden Appliance). That’s great Shey! Post dayun pics! That's great Shey! Post dayun pics! Cool…a library-type coffee shop. I’d like to see this when I go visiting in Iloilo again (I went to school there.). Hi Sonia! Thanks for dropping by. Yes Book Latte is indeed an awesome and unique place and its perfect for bookworms! Hope to meet you when you come back to Iloilo. wow! this is a pretty good place ah.. do you have any plans in bringing Book Latte in Quezon City ? Hi! Are we allowed to bring and read our own book there?